“It’s because of Hillary,” she said. 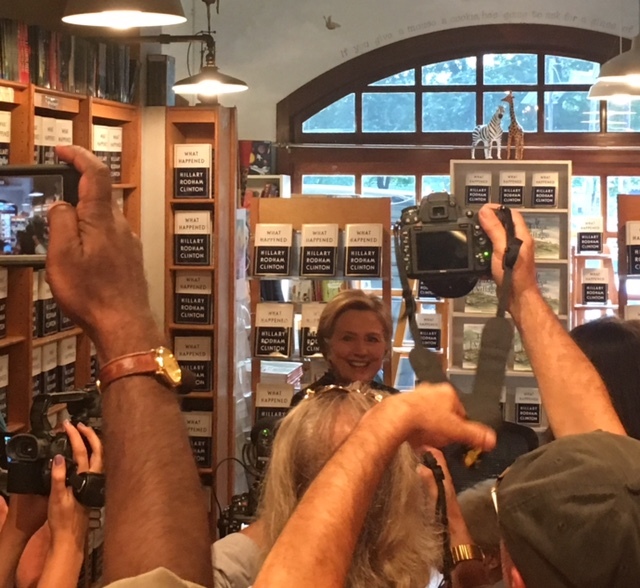 I was not one of the lucky 1,000 people to score a ticket for Hillary Rodham Clinton’s book signing here at our own Watchung booksellers. Apparently, they sold out in an hour. One of the things I love about Montclair is how that camaraderie shows up everywhere. Exercise classes. Library events. Town soccer. The Van Vleck Plant Sale. We have big town amenities (art museum, indie movie theater, a minor league baseball stadium) and a small town vibe. In my opinion, Watchung booksellers contributes a lot to the overarching feeling of community. They support all the local writers (of which there are many!) through readings and book events, they host tons of book groups and children’s programs, they always have enough staff available to advise and recommend. And last night they brought us Hillary. In fairness, Back to School Night provides its own brand of camaraderie, especially at the high school. People you’ve seen throughout the years watching your kids play sports, serving together on PTAs, sitting against the window of Montclair Music Studio waiting for Abigail’s violin lesson to end – all come together for a few hours. Clumps of old friends convening in front of the Nurse’s Office or outside one of the stairwells during their children’s lunch period. It honestly feels like a great big cocktail party (although without any cocktails). I’m the mom who always looks forward to Back to School Night, especially for the feeling of community. But I will admit this: If I’d gotten a Hillary ticket, I would have happily cut class.